Jesse Lingard is a player who divides opinion among United fans. In fact most fans, on social media at least, thinks he’s useless and not good enough of wearing United’s famous red shirt. While those sentiments are not mirrored by the majority of match going fans who loves local players, the truth is most fans making their voices heard on social media don’t understand what Lingard is good at. He’s not like Anthony Martial who catches the eye by tying opponents up in knots and making them fall over when dribbling at pace. Neither is he like fellow local lad Marcus Rashford who excites fans with his pace, dribbling and goalscoring. He’s definitely not like expensive signings like Juan Mata and Henrikh Mkhitaryan who many feel should be in the team over Lingard since they have “more quality” and are “better”. The truth is Lingard at this present moment is a better player than both Mata and Mkhitaryan and deserving of a place ahead of them in the team. The reason Jesse Lingard is so heavily criticised online is, firstly, because he isn’t an exciting, big-money signing which fans of today crave and secondly, they don’t see what he’s good at. Look closer, though, and you’ll see why Sir Alex Ferguson, Louis van Gaal and Jose Mourinho likes him. It’s easy to understand too, because Lingard is a very talented attacking midfielder with good passing in tight areas, he’s skillful, great in combination play and a good finisher. He’s also a hard-worker off the ball and follows instructions to the letter. More than anything else, he’s highly intelligent and is superb at identifying spaces to exploit. Lingard can play anywhere across the attacking midfield positions in United’s 4-2-3-1 and as the sole attacking midfielder in their 5-2-1-2. If they switched to a conventional 4-3-3 in certain games, Lingard could easily play in central midfield in that system. Despite the quality he has on the ball and his energy when pressing, I think he’s appreciation of space to attack and his movement to find these spaces are his two main qualities. First I’ll focus on his ability to find space between the lines. In the image below, Chris Smalling carries the ball forward for United. 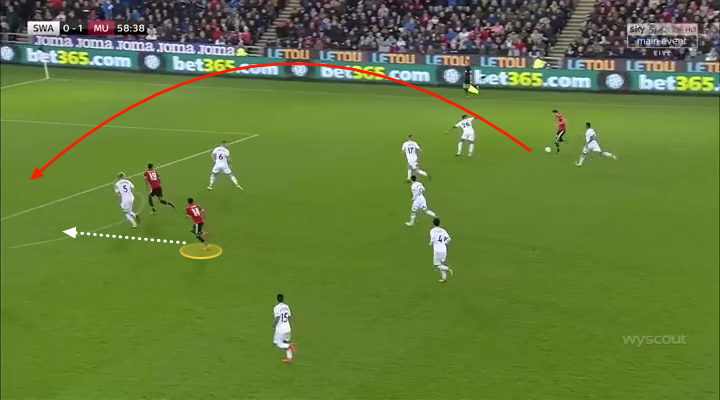 Lingard initially started in front of Swansea’s midfield around where Matic is now positioned but as the ball moved towards the right to Smalling, he adjusted his position and moved in behind Swansea’s midfield. He’s now in a good position and gives Smalling a good option to progress the attack. The centre-back declines this option, opting to instead go back with the ball. If Smalling had trusted in his own ability to make that pass and dared to take the risk, Lingard could have turned and attacked Swansea’s back four with Rashford. This image below is from United’s clash with Antonio Conte’s usually ultra-compact Chelsea from last year. Lingard has identified a gap between Nemanja Matic and N’Golo Kante and makes a run into the empty space between the lines of Chelsea’s midfield and defense. He even points to Marouane Fellaini to make the quite simple pass into the path of the Mancunian. The Belgian, like Smalling in the earlier example, decides to play the ball back to his defenders instead. Again, Lingard has found a good position in a space from where he can pick up the ball and hurt the opposition, but his teammates decides to take the safe option and go back with the ball. This time, Lingard has moved into a position behind Swansea’s midfield and is positioned on the half-turn, ready to go forward if he receives the ball. Ander Herrera has an open passing lane between two Swansea midfielders, is under no-pressure what so ever and can see Lingard. Despite this, the Spanish midfielders decides to play the ball sideways to Scott McTominay. A third example of Lingard moving into a great position from where he can hurt the opposition if he receives the ball but is teammates opts to go for the safe option. We’ll take a fourth example. This is against Watford last week when Lingard shone in United’s 4-2 win. Lingard has gone to receive a throw-in and dragged the Watford midfielder Abdoulaye Doucoure with him. 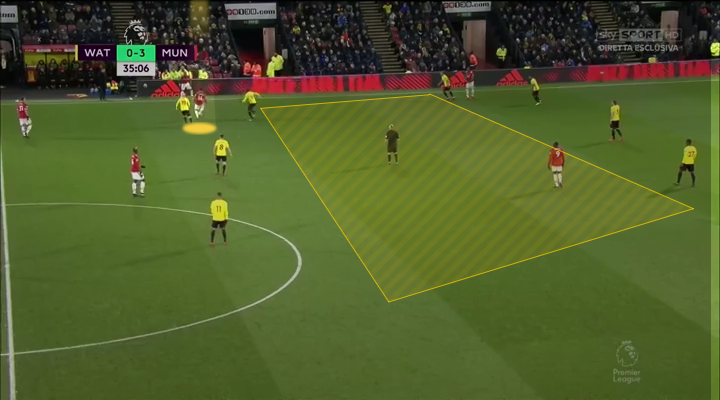 With Tom Cleverley just outside the centre-circle attracted to Paul Pogba, Watford have left a huge space between their defense and midfield. Lingard has already identified this space. After a quick pass back to the throw-in taker Ashley Young, Lingard will spin out and move into this space as you’ll see in the next image. Now Matic has the ball and Lingard is making his presence felt, signalling with both arms that he’s free between the lines. If he receives it he, Lukaku and Rashford can attack Watford’s defense. 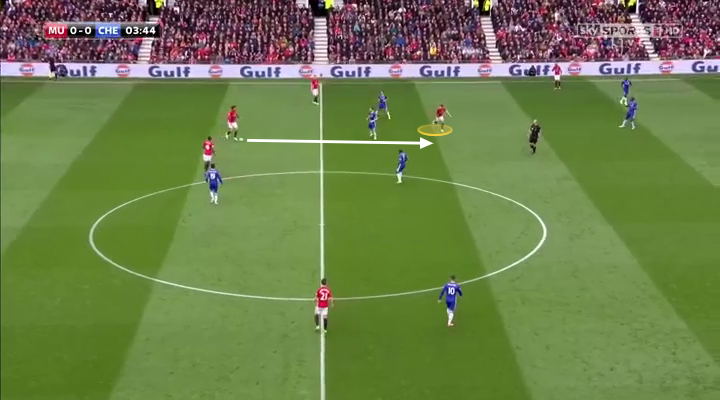 Matic also have an open passing lane to Lukaku. He declines both passes to go sideways to Pogba. Once again, Lingard identifies space which he looks to exploit but his teammates decide against progressing the attack. As these images hopefully shows, Lingard is excellent at finding space between the lines. In fact, he’s the only United player consistently doing this well. 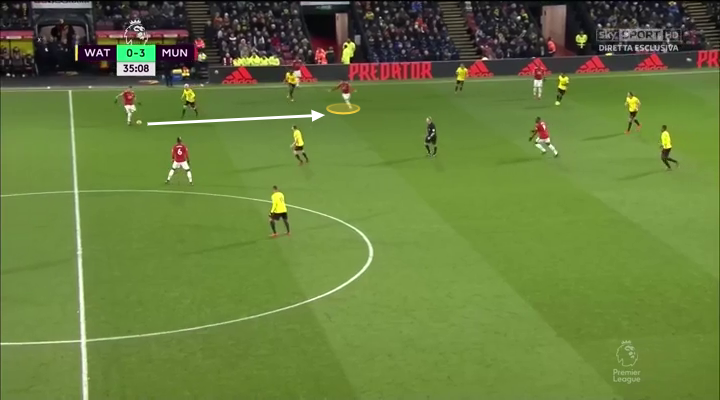 His presence in these positions gives United a well-needed option to link play within the opponents defensive block, which I’ve discussed United’s issues with here, but the United defenders and central midfielders are reluctant to move the ball into these positions, which makes their attacking play predictable and often ineffective. The only player who consistently passes the ball into these spaces is Pogba, and it’s no surprise that some of United’s most flowing displays have come when Pogba and Lingard has been allowed to combine in central areas. If Lingard is excellent at finding space between the lines, he’s almost equally good at picking his moments to attack the space in behind the opposition’s defence. Especially when deployed in a central position, Lingard reads the game well and makes runs into depth from where he scores or creates space for someone else as he pushes the defence deeper. This adds to the image of Lingard as a really mobile player as he doesn’t only moves horizontally, but also vertically. In the game at Swansea, Lingard scored two excellent goals. This one came from a switch of play out to the right wing where Matteo Darmian received the ball. Even before the ball reached the Italian, Lingard had started a run towards the box and identified the space behind the back of the right centre-back who is busy with watching Rashford’s run. Therefore, space opens up, Lingard attacks it, the cross is great and Lingard’s headed finish is excellent. His first goal of the night can be seen below. Herrera makes a pass to Rashford who makes a run towards the Spaniard. Rashford’s run brings a defender with him which again opens up space in behind to attack. Lingard has already read the situation and simultaneously as Rashford meets the ball, Lingard goes in behind. Rashford flicks the ball on and Lingard is through and calmly finishes well. Jesse Lingard is a very good player. He’s great in combination play, he’s skillful, he passes well, crosses well and is a good finisher. He also works hard and follows instructions from his managers. Lingard’s also an highly intelligent attacker who reads the game well which helps him identify spaces to exploit. He sometimes moves wide to find space, but mostly he finds it between the lines or in behind the opposition’s defence. 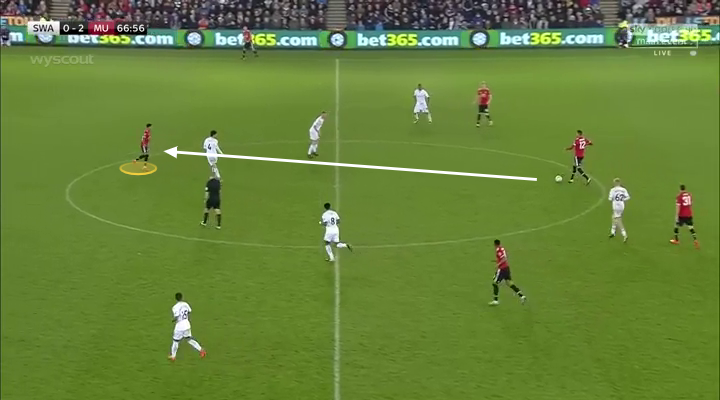 If his teammates becomes more progressive in possession, United can benefit greatly. It must be said that Lingard is by no means a world beater. United could probably add a similarly intelligent player with more quality on the ball. Sometimes he rushes shots, he can be inconsistent with his passing and crossing but he always makes up for any shortcomings with hard work. Should United’s attacking play revolve around Jesse Lingard going forward? Probably not. Is he a valuable member of the squad? Absolutely. On current form, Lingard should be in the starting eleven ahead of both Mata and Mkhitaryan. He’s got better numbers than both for starters and he brings the best out of his teammates in a way few players does. Martial and Rashford in particular thrive with Lingard’s quick passing. Finally, Jesse Lingard is a Manchester lad, playing for the club he loves and is a very good player. He should be supported by all sets of United fans, because he’s a credit to their youth system and their first team. England can benefit from him in Russia, too.